A little familiarity and a boost of confidence can go a long way. 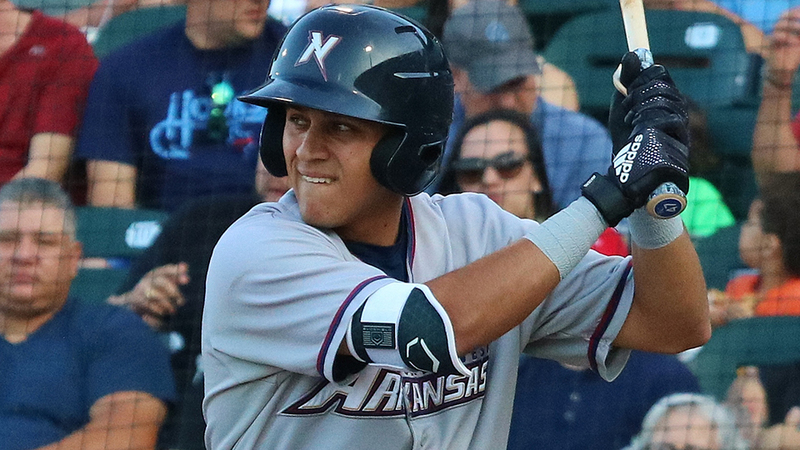 They've taken Northwest Arkansas infielder Nicky Lopez to the start of what likely could be his best season since being drafted by Kansas City in the fifth round two years ago. The Royals' sixth-ranked prospect was hitting .332, which ranks sixth in the Texas League, with a .406 on-base percentage while slugging .401 heading through 50 games. All of these count as improvements over last season, which he admits was a challenge, playing a full slate of professional games for the first time. "I struggled a little bit toward the end of last year -- had some fatigue," he said. "This year, I just wanted to come out of the blocks early and go to work." The 23-year-old middle infielder got his first taste of the Texas League last season, but hit just .256 in 59 games. Still, he got an invitation to the Arizona Fall League, where he batted .383/.433/.568 for Surprise after experimenting with a new bat and taking some advice from the Surprise Saguaros hitting coach. Jobel Jimenez, now the hitting coach for the Springfield Cardinals, convinced Lopez to straighten his stance and simplify his approach. Then, when equipment vendors were making their way through Arizona, he began experimenting with a new bat that was an inch longer and heavier than he was used to. "I used it in a game and I did well and I just kept using it," he said. "And from then on, I threw all my [old bats] away and just use these." The results helped Lopez mentally, too, considering the AFL is thought of as a finishing school for some of the game's brightest future stars. "Once you start producing there, you're playing on the field with the best prospects in baseball," he said. "You're like, 'Hey, I belong on this field. I can do this.' The confidence boost is just unbelievable." Lopez still remembers how he faltered toward the end of last year, when he hit just .220 after Aug. 1. His concern now is maintaining his success over a full season. To that end, he's participating in a training regime designed to add weight, hoping he can avoid the pitfalls from last year. "Last year, I was a little fatigued toward the end," he said. "I wasn't used to the full season. Now I know what to expect." Considering the position he's put himself in to continue advancing in the Royals system, Lopez wants all the at-bats he can get. "It's a huge opportunity, and people sometimes take that for granted," he said. "I don't take it for granted. I know being in Double-A is a big deal, and I'm just taking it one day at a time." Hooks trio: If you want to find the best hitters in the Texas League this season, look no further than the Corpus Christi Hooks lineup card. Myles Straw, Randy Cesar and Taylor Jones rank first, second and third in batting average, respectively. Straw, who had five hits on May 26 against Tulsa, is hitting .371 to lead the league, while Cesar is second at .367 and Jones is third at .354, more than 20 points higher than fourth-place Connor Joe of Tulsa. The Hooks' .298 team batting average is 22 points higher than second-place San Antonio, and they also lead the league with 297 runs scored. Simple switch: Braden Bishop hasn't stopped hitting since a small change earlier this month -- to a No. 7 jersey. The Mariners' No. 5 prospect was hitting just .154 through May 4 while wearing No. 1. But since the switch, he's looked every bit like a top outfield prospect, hitting .347 with six doubles and two home runs with a .407 on-base percentage and slugging .465. Power surge: Michael O'Neill struggled through his first time starting a season at Double-A Frisco, hitting just .203 with one home run through April. But O'Neill, a third-round pick out of Michigan in 2013, has been hard to slow down throughout May, especially over the last two weeks. O'Neill has clubbed seven homers since May 16, including two on May 23 at Northwest Arkansas and May 29 at home against the Naturals. He has nine home runs while raising his average to.259 in 42 games with the RoughRiders.